There are at least three kinds of international restaurants. The first, thankfully on its way out, is a mediocre translation, an entire cuisine simplified to its least-foreign elements. The second aims to emulate a sort of one-hour vacation abroad, with decor heavy on travel posters and souvenir art and a fuller, more representative selection of cuisine. The third type is one that Pittsburgh, until recently, hasn’t seen much of: Call it “for us, by us.” International restaurants aimed at diners already fluent in the cuisine offer the most authentic, immersive version of a virtual trip abroad. When the food is by and for the locals, so is the vibe. Pittsburgh’s selection of Mexican dining has cycled rapidly through these stages. 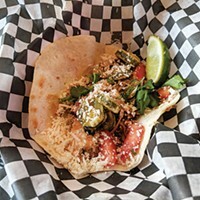 But while Mexican-run street taco stands have proliferated, we haven’t really had the third kind in a sit-down setting before La Catrina, in Beechview. That neighborhood itself has become the closest Pittsburgh has to a Mexican quarter, complete with the neighborhood grocery being a supermercado. La Catrina feels tightly connected to this community, while also being welcoming to visitors. Some restaurant-goers may be concerned that an unmitigated foreign experience will leave them unsure of what or how to order, but La Catrina’s menu is reassuringly familiar. 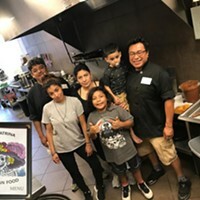 Owner Demetrio Aragon is from Mexico City and does not shy away from Tex-Mex — a cuisine in its own right — offering a balance of tacos, enchiladas and the like with authentic fare for his compadres. In a nod to a time-honored practice of Chinese restaurants, a white board openly labeled “Secret Menu” displays a selection of special appetizers and entrees complete with descriptions written in Spanish. From this menu, Jason ordered eggs with chorizo, which were scrambled together and served with warm flour tortillas and refried beans. It was simple, savory and satisfying. A side of nopales, sautéed strips of cactus paddle with caramelized onions, would have been a perfect accompaniment, except for a surfeit of salt. Seasoning was again an issue with the tortilla chips. House-made, of course, the chips were addictively thin and crispy; our first batch was under-salted, and our second, perfect. The queso dip was no more, no less than simple, creamy white cheese, but the chips found their heavenly match in La Catrina’s extraordinary guacamole. Made to order in a basalt molcajete, it was a little chunky, a little spicy, and topped with a spoonful of wonderful pico de gallo, the piquant tomatoes and onions adding brightness, fruitiness and still more heat. Tortas — Mexican hoagies, if you will — are traditionally served on cemita rolls, which aren’t precisely like any common American bread. We were a bit concerned to see that La Catrina uses Italian rolls, but Aragon must have done some hunting to find ones that approximate cemitas superbly, with an airy crumb and just enough crust for presence without resembling a baguette. Jason chose the torta milaneza, thin, breaded steak with avocado slices, onions and jalapeño salsa. The layered flavors came together wonderfully, with the rich and creamy avocado acting almost as a condiment. Fries on the side were light and crisp. La Catrina offers a half-dozen tortas, all distinct, and worthy of a special trip. Meanwhile, Angelique indulged her love of enchiladas verdes. La Catrina’s version was made with simple, cheese-stuffed enchiladas and came with a thin slice of steak — bistek — on the side, or rather, on top. If the steak wasn’t quite as seasoned or as tender as we would have hoped, the enchiladas were all that and more: supple tortillas, plump with crumbled-cheese filling and scattered with more on top, then generously ladled with tangy yet mellow roasted-tomatillo salsa. Add hearty rice and beans on the side, and the perfect circle of salty, sour, savory and even sweet flavors was complete, as was the enchiladas’ sturdy yet pliant texture; the portion — three fat rolls — was more than ample. 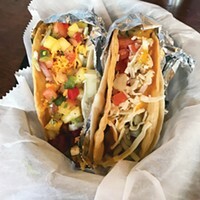 Tacos are available in a choice of traditional Mexican style, with onion and crumbled queso fresca, or Tex-Mex, with shredded iceberg lettuce and grated cheddar cheese. Both are served in the classic way, enfolded in doubled corn tortillas (flour are also available). For Tex-Mex purists, ground beef is an option, but we went for chorizo, Mexican style. From tender tortillas to savory-spicy sausage, they were pretty terrific. 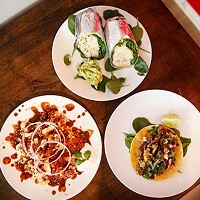 For simple, satisfying Mexican food that caters to both authentic and American tastes, La Catrina is a solid choice, with a bright, welcoming, family-run and family-friendly atmosphere. Editor’s note: After more than 14 years of dedicated eating and evaluating, this is last restaurant review from Angelique Bamberg and Jason Roth. To read more about their experience, click here.